Post a setup that is retro or "greescreen"-like. We'll cast the vote during the rest of the month and post result in the end. But what if i consider something retro that others don't. (16-06-2017, 02:13 PM)Mafia Wrote: But what if i consider something retro that others don't. You'll most likely get the least votes! Now.I'm curious though..
On my list of "fun tech projects", there's been an entry for several years that would be perfect for this: "Put Debian Etch on my Mac LC III"
Nah I don't have anything, I just wanted to talk. My stuff isn't cool enough for the retro club. One week might not be enough so let's allow team work, multiple persons can work on the same rice. Let's also allow customizations that you haven't made specifically for this contest. Tell me what you think and remember. 2. venam: Good start for a not-so-retro desktop - but it looks undecided between early-90s Amiga (Worker), 8-bit computing (these colored lines in the top left corner), late-90s Windows (the background image), DOS (the sysinfo in the top right corner) and 2010 (transparent urxvt windows). It's a theme, you can go beyond it, don't limit yourself. If the contest was simply about reimplementing a vintage machine it would be boring. 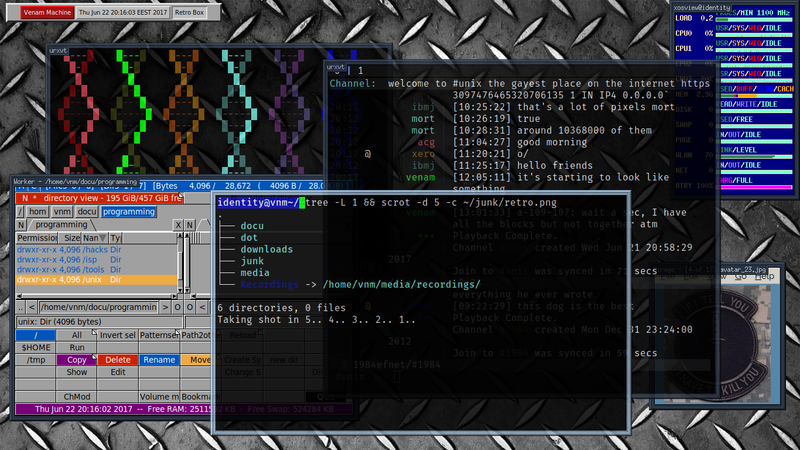 (22-06-2017, 02:58 PM)jkl Wrote: 2. venam: Good start for a not-so-retro desktop - but it looks undecided between early-90s Amiga (Worker), 8-bit computing (these colored lines in the top left corner), late-90s Windows (the background image), DOS (the sysinfo in the top right corner) and 2010 (transparent urxvt windows). You're good, you've hit 90% of them. The prompt is also DOS. I've mixed a bunch of different sources. EDIT: I should have used "fake" transparency but I didn't bother. EDIT2: Also the WM is UDE which is late 90s, early 2K.